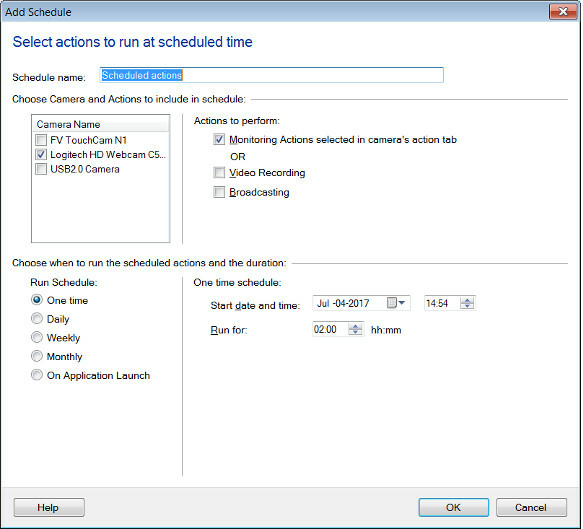 The Scheduler in WebCam Monitor allows you to set the start and stop time for a camera to automatically begin and end Monitoring actions, Video Recording and Broadcasting. You can configure an individual schedule for each camera. To schedule a device, click Tools >> Scheduler >> Add. Schedule Name: You can specify a name for the schedule. This will avoid any confusion if you are scheduling multiple cameras separately. Camera List: A list of cameras will be visible, if multiple cameras are added to WebCam Monitor. You can check the cameras you wish to schedule. Monitoring Actions or Video Recording: Use the Monitoring Actions to have alerts such as recording or take photo on motion detection. The other option is to record video. Broadcasting: By selecting this option, you will be able to schedule the broadcasting of live video. Perform actions: You can choose the type of scheduling and configure the Schedule settings.